STOP HS2 | HS2 Ltd fiddle the figures again, ignoring their own forecast by saying electricity prices never go up. 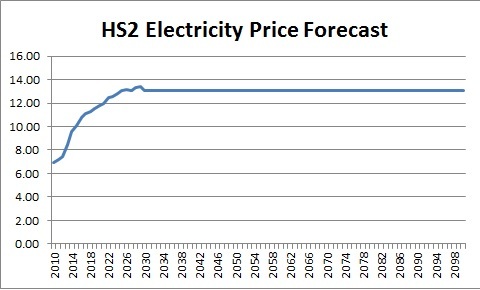 HS2 Ltd fiddle the figures again, ignoring their own forecast by saying electricity prices never go up. Deep within documents buried by HS2 Ltd, Stop HS2 has found that HS2 Ltd have kept the projected running costs of the network down, by assuming that there will be no upward variation in the retail industrial price of electricity except for inflation, ignoring their own forecasts for energy price rises. Whilst having made a forecast for electricity prices, HS2 Ltd decided to ignore it and use the baseline 2011 price without any assumption of beyond inflation increases. The costings were made in 2013, when HS2 Ltd already knew that electricity prices had risen by 20% since the 2011 figure they decided to use. HS2 Ltd may have decided not to trust their forecast as for 70 years from 2030 to 2100, they again assumed there would be no increase beyond inflation in electricity prices. However, it is more likely that they wished to ignore 18 years of projected inflation busting increases, which end three years after Phase 1 of HS2 is due to open, when HS2 have actually forecast a reduction in electricity prices. In another move to keep costs down, HS2 Ltd have used power consumption figures for 200 metre trains, when the actual trains planned to go on dedicated HS2 routes would be 400 metres long and require more power. It is also the case that none of the staff working on HS2 after it opens are forecast to ever get a real terms pay rise. At over six billion pounds for sixty years, which equates to around £180m per year, electricity costs represent the largest single item of the HS2 running costs. In a spreadsheet labelled ‘Phase 1 and Full Network Costs’, which accompanied the October 2013 ‘Economic Case for HS2’, HS2 Ltd detail their forecasts for industrial electricity prices. HS2 Ltd attempt to forecast electricity price rises. Between 2011, the baseline year, and 2029, HS2 Ltd forecast that the retail industrial price of electricity will almost double from 7.19p to 13.45p per kilowatt hour. This represents an 87% increase over inflation in 18 years, which HS2 Ltd have chosen to ignore in their overall cost calculations. However, HS2 Ltd then forecast that in 2030, prices will drop to 13.05p/kWh just after Phase 1 is due to open, and remain at that level until 2100. This would represent a 3% decrease in electricity prices, after inflation. All figures are based on a 2011 baseline. It is also case that electricity costs have the smallest contingency rating of all HS2 costs, set at just 10%, whilst staffing has a contingency of 30%, and maintenance and insurance are set at 41%. To access the spreadsheet go to http://www.hs2.org.uk/news-resources/economic-documents and download the zip file labelled ‘Economic Case – Appraisal spreadsheet’. The file is named ‘Phase 1 and Full Network’, and access the third orange tab labelled ‘Electricity Price Forecasts’. The formula actually used to work out costs is labelled ‘Electricity Costs’. The contingency figure is marked ‘Traction’ in the ‘Universal Inputs’ tab. Pingback: STOP HS2 | Hidden costs mean billions more will have to go on the HS2 bill. QED – little by little. Of course, as shown under this tab, some trains will be of 2 units so that the actual total ‘train’ km pa is about 81mil. The lower table also shows that Pendolino trains (WCML) will lose overall about 19mil km pa (with most at Phase 1) and what must be ECML loses over 11mil km at Phase 2 so existing West and East mainline services lose a combined 30mil km (?? ?% of existing). There is some compensation with big increase in EMU 8-car so no more waiting in the rain for Milton Keynes! The average units per train is 110/81 = 1.36. If 30 units are on daily standby (no doubt actual nr is somewhere in the data), the average number of trains running throughout the day is 150/1.36 = 110 trains. The total ‘train’ km pa 81mil, average train km per day is 81m/365/110 = 2017 km. This is still only equivalent to 3 return trips Mcr-Euston. Perhaps HS2 are holding back on total capacity. Either way, as pointed out in the original STOPHS2 posting, the HS2 projection for electricity costs appears to be part of the ongoing massaging of the figures. Correction – was not a valid calculation so please ignore previous posts. at lower kWh / km which I did not appreciate – no apparent way to break down. You might look at the rest though. Before anyone else gets the chance to scoff, I would like to suggest you meant p/kWh rather than £. The argument stands because the ratios are the same. Of course their figures are ridiculous. Annual Electricity cost = £180mil = £1mil per 200m set per year – how convenient is that??. One set uses elec £1mil/365 = £2740 per day. With electricity cost 7.25p/km, daily elec usage = 2740 x 100 / 7.25 = 38,000 kWh per day (rounded). Average distance travelled per set = 38,000/25 (kWh per km) = 1500km per day. Thus the average travel of the whole fleet will be under 1000 miles per day = little more than 2 return trips Manchester – London or 5 hours on track per day. You need not worry about your inaccuracy. How long will his nibs get away with proclaiming that he is not just investing in HS2 but that Network Rail will invest £38bn over the next five years? The real figure is more like £12bn (over 5 years) and most of that is on long overdue electrification and finishing off Crossrail / Thamelink.